During their week in LA, MFBTY stopped by MNET’s “Danny From LA” for a brief chat with hosts, Danny Im and Dumbfoundead. Danny and Tiger reminisce about when they were both performing in the 90s (Danny when he was in 1TYM, Tiger JK as part of the group, Drunken Tiger). The two were ironically intimidated by each other. For the impatient, you can fast forward to 17:40 to get straight into the interview. P.S. The intro segment of Dumbfoundead trying to teach Danny how to rap is classic. R16 – The Front Row Experience. It is 6:55pm, five minutes before the show starts. Another Drunken Camper and I are in the front row getting wet from the rain. However, that doesn’t stop the crowd from going wild with anticipation. The show finally starts, and it starts off right with Dumbfounded, a Korean rapper who mostly known for his battling skills on Grind Time TV. He had a real laid back sound that reminded me of Lupe Fiasco (Be sure to be on the lookout for Dumb’s album coming soon. Do your research!). After Dumbfounded, Bizzy & Palo hype up the crowd before JK’s appearance. When JK comes out, the crowd loses it (You could probably here his name being echoed in Seoul). He starts with “Do You Know Hip-Hop,” one of my personal favorites from his Year of the Tiger album. The crowd is reciting line for line with so much energy. I end up getting hit in the head a couple of times by fans who are waving their hands back and forth, and it’s somewhat of an annoyance. However, JK’s performance is so hypnotizing that it doesn’t matter. Next he performs, “Isolated Ones! Left Foot Forward,” followed by “Good Life,” and then “I Want You,” which is mixed in with Dr. Dre’s “Next Episode.” This was my first JK concert, and watching JK’s concerts on YouTube couldn’t even compare to this. The best part about being in the front row of the pit is getting the chance to see the artist up close and being more personal with them. JK doesn’t mind the personal bond either. After coming down from the stage more than five times, you can sense the joy he feels from his interaction. It’s a thing that some American artists won’t even do at their shows, and the fans appreciate it greatly. JK then introduces fellow Drunken Tiger member, Roscoe Umali, and I think El touched upon this performance pretty well. See here for more details. Afterwards, Epik High takes the stage with a splash, throwing water into the crowd, waking me up from the trance I was in after JK’s performance. Epik’s performance sends the crowd on a buzz that is surely felt. Soon after, they introduce Dilated People’s Rakaa. Man… for those who don’t know Rakaa, do your research! This guy is nothing to mess with! Rakaa brings the crowd back to reality with the message to keep supporting Korean hip-hop because Korea has some of the greatest hip-hop artists alive. He was sharing the stage with some of them that night, so he knew it all too well. Wait, is that beat what I think it is? Where’s my camera? As “Monster” starts playing, fans beside me lose it. Every one of the perfomers is back on stage doing their own verse on the “Monster,” beat. I try hard to keep my camera from shaking because the crowd behind me jumping up and down. My camera battery starts to die, and I start praying it’ll hold out to record this rare moment. Luck was on my side as my camera survived the 6+ minute performance. While being front row is great, there’s always that crazed girl next to you that won’t stop screaming (you’ll hear her in the video). So El uploaded her footage from backstage. It’s tamer than the video I have, but it doesn’t have any distracting screaming girls. After the concert, an angel from nowhere gave us the okay to meet the stars. The fellow Camp member I was with in had caught Roscoe’s Vlado sneakers that were thrown into the crowd, and one of the show organizer’s who saw it let us enter to get the shoes autographed. In the midst of this, we were able to meet some of the performers before they left. And despite being such an influential force in the hip-hop world, these guys are some of the most down to Earth emcees I’ve ever met. Seriously, this stuff only happens in dreams! We ended the night on a high note and our hour and 1/2 bus ride home wasn’t even felt. Despite feeling hungry, tired, and wet from the rain, truly, this was an experience that will never be forgotten. Sunday, Sept. 27th,2009— A small group of Camp fans meet up at 1pm in Gangnam to journey to Incheon, a quaint city about an hour and 1/2 drive away from Seoul. After scouring the streets to find a quick meal and finding the right bus stop, we hope on to the empty bus questioning if it’s going to take us to the right part of the festival. We look at the maps we have and the site looks huge and confusing. We worry that we won’t get there in time to claim a good seat (it was first come first serve). Our group finally finds the stage. We spot a few DT fans that show up at JK’s shows regularly. It is only 4pm and the seats start to fill so we scour for the only front row seats there. About 5:30pm, Roscoe’s team arrives and grants me a pass so I can document the show for Camp (thanks, Eugene :]). My team mans the fort in the front row and promises to take photos/video of the performance. Any other person would probably crap their pants if they were allowed backstage access to this show, but for a lot of people there, it was a simple reunion between friends. The artists have all worked with each other in some form, while others from the entourage have crossed paths via collaborations or simple friends of friends (saw some surprise faces I have not seen in ages and it simply was a “WHAT THE? !” moment every 10 minutes lol). Roscoe’s team is the first to arrive. He mentions he has been ridiculously busy performing and penning for some major artists back in the US. He hasn’t been back to Korea since 2001 and hasn’t been on stage with JK since 2000. It’s a bit of a surreal feeling for him. He is jetlagged and feens for an energy drink to get his gears moving. Korea is not too big on energy drinks, and they’re particularly rare in Incheon, so a coffee from on the onsite CVS/GsMart is brought in instead. 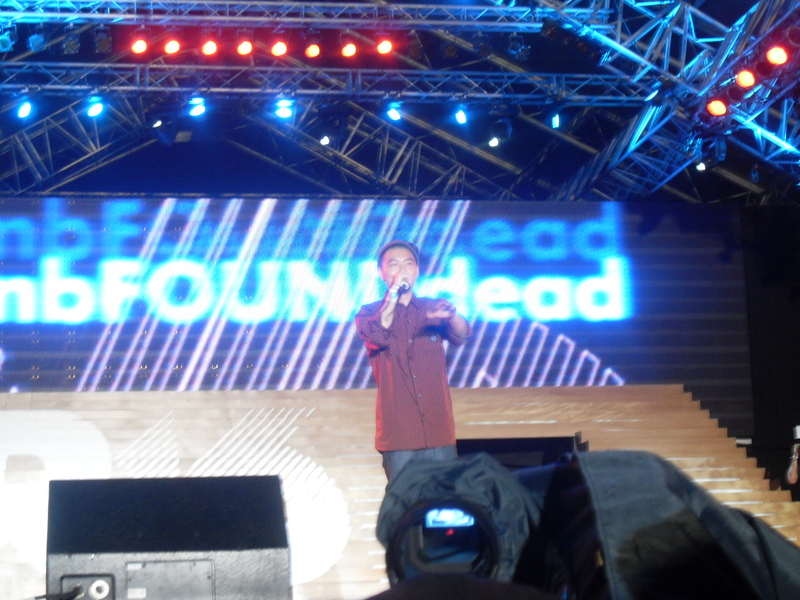 Dumbfoundead and Rakaa soon arrive and the present team talk briefly about how the day’s performance is going to go. Roscoe’s team puts the final touches on his set, but they await JK’s arrival to talk about how they’ll execute “Monster,” the English version. With Rakaaa and Roscoe there, they can perform the English version, but need to coordinate how they’ll fill in Rakim’s and Tasha’s verse. It’s 32 bars missing and other emcees are needed to fill in. Pictured above: Glen (AOW, Roscoe’s management team), Bizzy, ? (I’m so bad with names so I’m sorry to this person), Dumbfoundead, Justin (AOW, Roscoe’s team), Rakaa, Eugene Techbeatz (AOW, Roscoe’s Managemeant Team, producer of “Monster,” and half of DT8), ? (again, bad with names), Roscoe, JK, and Palo Alto. JK arrives and photographers ask to take a group photo of all the performers (sorry Epik fans, I think they missed the cue for this one). JK first takes the time to catch up with the old friends. He talks with Roscoe about his health, the industry/the company (Jungle), and of course his married with children life. It’s not an easy task for him to juggle everything, but he’s motivated by his family to keep going. In the midst of this, they pose. They begin organizing “Monster,” but some of the other emcees have stepped out for a bite or haven’t arrived yet. So the present team begins assembling what they have. The English instrumental of “Monster” is a whopping 6+ minutes and there is some concern about executing it for the first time in front of a live crowd. The rest of the crew arrive and they pow wow in JK’s dressing room. After 15 minutes, they reorganize the whole song: Mithra & Tablo will start with their own verses and fill the first 32 bars, Rakaa proceeds, Roscoe next, and then JK will finish with his Korean verses. As the team puts the final touches on their sets, a crowd waits impatiently outside. J starts with “Do You Know Hip-Hop,” and warms up to the crowd. Within minutes, JK is at the foot of the “pit” (front area crowd of fans). He is within touching distance of fans, and the crowd goes bananas as he stands close to them. After JK’s set, Roscoe comes out and clearly some of the DT fans in the crowd recognize him. However, as Roscoe holds up his signature customized Vlado sneakers, the crowd erupts. They beg and scream, yearning for the shoes [they run about $100 in market value]. Justin, who hypes up for Roscoe during his set, takes the sneakers and holds them up to tease the crowd. Meanwhile, Roscoe is doing his signature hit, “Live It Up,” and keeps the crowd screaming. Justin steps into the pit and [here is the irony] gives the sneakers to one of my friends that came with me (thanks for making his trip worth it, guys!). After the show, some last minute photos are shot. As the day winds down, JK walks out to his van and a flood of fans are waiting behind the gates to catch of glimpse of him. R-16 is the one of the most anticipated b-boy festivals in all of the world. But this year, it has one of the most exciting concert line ups ever. Drunken Tiger, Roscoe Umali, Epik High, Dumbfoundead, and Rakka from Dilated People, are set to perform at the festival’s final event. Price: 18,000 won, 14,000won if you’re a foreigner (come with your passports or ARC cards). Where do I buy it: Tickets will be available on the door. R-16 is part of the Incheon Global Fair and Festival this year and they are in control of the tickets. Seating is first come first serve, so go early. From Seoul: Take Subway Line 1 and change to the Incheon Line at Bupyeong (부평) Station. Get off at Central Park (센트랄파크) Station, which is the end of the line, and come out of exit number 2. The Global Fair and Festival entrance will be in front of you. Once you pay entry and enter the fair, find your way to Bi-Ryu Performance Stage where R-16 will be happening.